Whether people would like to admit it or not, December brings about an air of festivities for all. The celebrations begin with ThanksGiving and will end with New Year celebrations. Shops are decorated, Christmas sales are on, friends and relatives share decorated streets, trees, homes photos. One cannot help but get drawn to this seasonal celebration. I consider myself very lucky that I get to enjoy Diwali, Eid and Christmas. As a Hindu living in a predominantly Christian Country and a strong Muslim part of Kenya, I get drawn into celebrating all three festivals. When Kalyani of Sizzling Tastebuds suggested Whole Grained Holiday Breads, I tried looking for recipes where I could use whole grains. There are many recipes out there using spelt and rye flour. I don’t get either in Kenya or India. Kalyani suggested that we try and use whole grain as much as possible. I was nearly going to sit this one out as I know 100% wheat festive bread can turn out pretty dense. You know how sometimes light bulb moments happen, well I was rolling out rotis for dinner and suddenly it dawned on me that the flour I’m using is a multigrain flour. Why not use that for the bread, I thought? Well, tweaking an oatmeal bread recipe to fit into a holiday bread, I got this delicious, not so sweet bread and the family enjoyed it for breakfast. You’ll laugh at the combination the family requested with the sweet bread, not honey, jam or marmalade but fried eggs with masala (spicy) tea! Oh well! Keeping in mind the need to include multi grains in ones diet, many flour companies in India now sell multi grain wheat flour or atta as its commonly called. All Indian households use atta on a daily basis to make flatbreads like parathas, rotis, puris etc. The flour that I used has wheat, finger millet, soya, chickpea,oats,barley and maize. 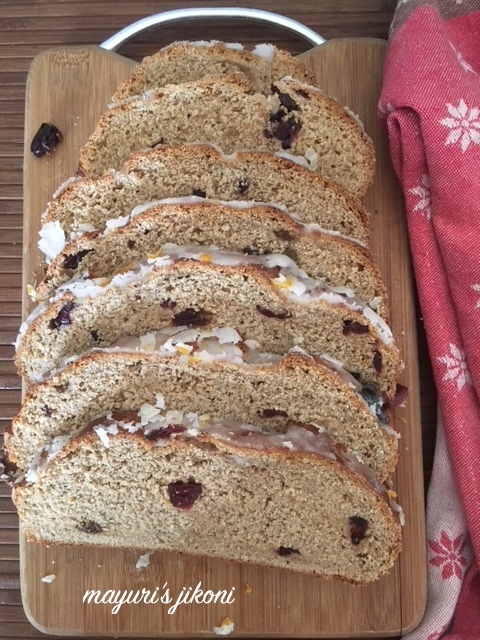 By adding dried cranberries and topping it with orange glace icing, this was definitely a delicious holiday bread. I also added gingerbread spice. Christmas season and no gingerbread spice? That is not possible. The whole house smelt so aromatic while the bread was baking. Take a ¼ cup of the warm milk. Add a tsp of honey and mix well. Add the yeast. Cover and let the yeast ferment for 10 minutes or until the mixture is frothy. Add oats to the remaining warm milk and let it soak for 10-15 minutes. Mix flour, all of the gingerbread spice and salt in a bowl. Beat the egg and add it to the oat mixture. Add honey, melted butter and the yeast mixture to the oat mixture. Mix well. Add the oat mixture to the flour and form a dough. Dust the worktop with little flour and knead the dough for 15 minutes by hand (or 10 minutes if you’re using the machine) till it is smooth. Form the dough into a round shape. Rub some butter over it. Grease a bowl with some butter. Put the dough into the bowl. Cover and let it rise till its double in size. Mine took 2 hours because of the slightly cold weather. Dust the worktop with little flour. Remove the dough from the bowl and deflate it. Add the cranberries and knead it gently. At this stage you can either use a loaf tin or make a round shape. I decided to make it round. Grease a baking tray with some butter. Place the shaped dough on it. Let the dough rise again for 45 – 60 mins. Brush the top of the risen dough with some milk. Bake the bread for 35-40 minutes or till the top is golden brown. Tap the bread at the bottom and it should hollow if done. Let the bread cool down completely. To prepare the icing, mix the sugar and orange juice till you get a thick creamy mixture. It should coat the back of the spoon. Drizzle the icing over the cake. The amount of water required may vary from flour to flour. I used honey instead of molasses. As no plain or all purpose flour was used, the bread will be a little dense. How much fun to live in such a culturally diverse area and to be able to celebrate all the different, Holidays, customs and traditions. You created such wonderful flavors in this bread!! Sounds completely delicious! What a flavorful and nutritious bread that is Mayuri. Using gingerbread flavors in a multigrain bread sounds absolutely amazing. I adore sweet breads and I can just smell the aroma from your bread with the spices and orange. Hello Mayuri, the flavours of your bread make my mouth water. Orange icing sounds so delicious on the flavourful bread. This is truly festive.